Calling all the New Yorkers out there. Before we moved from the Netherlands (I know I keep going back to those days…. 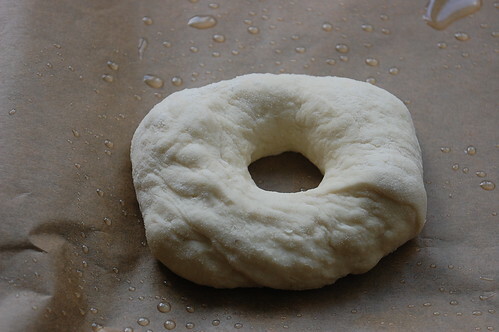 ), I tried my hands at making bagels. And succeeded too. And because I promised you bagels and Nigerian stews (not served together mind you) – here it is. See I feel that for my American experience to be complete, I have to go to certain places – New York City is one of them. A place I’ve long associated with fun, fashion and gastronomy. Whenever I think of New York, I think Blueberry muffins, hot dogs, bagels and a mean espresso. And though I haven’t quite made it that far yet, I was willing to search for the heady, fresh baked flavours of ‘New Amsterdam’. 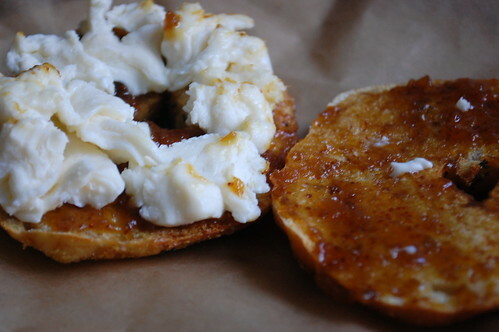 I found gorgeous bagels at Bagel Alley in The Netherlands and quickly acquired a taste for them. This café celebrates the yeasty bread treat – a touch heavy and chewy with that distinct, light sour taste and shiny top. I was astonished at the variety of bagel recipes on the menu – everything from the standard cream cheese to a ‘pizza’ and a BLT (Bacon, Lettuce and Tomato). And then a few weeks before we moved, working hard and all, I deigned to visit the office cafeteria…ok restaurant for lunch. For the four years I worked in The Netherlands, I took my own lunch to work almost everyday. Anyhow, they were out of the delicious pistolets which I’d somehow become addicted to in my irregular visits there. 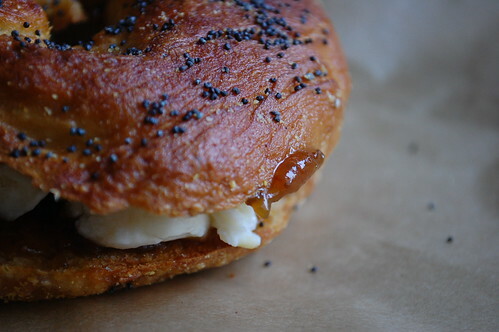 and so from the bread pile, I pulled out a plain, bronzed bagel, packed it in a bag and walked back to my desk where I proceeded to have the most delicious bagel for lunch I’d ever had – but that isn’t saying much considering the paucity of bagel experiences this woman has had. Regardless, it beat the ones from Bagel Alley hands down. Or maybe not. Perhaps I was just hungry. 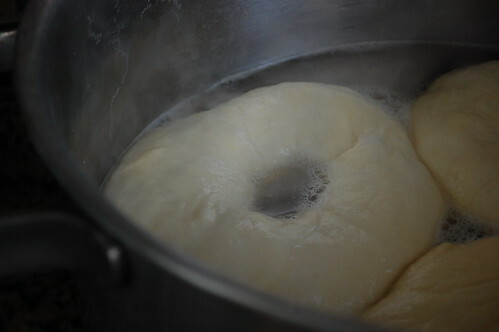 In actual fact, I’ve taken to making bread dough like I do with pancake batter – by eye, sans measurements. Who would have imagined that was possible? Certainly not me. I’ve known since March though that I would make bagels, when mademoiselle delicieuse mentioned the connection between bagel and pretzel bathing. But it wasn’t till a Sunday in July that I acted upon it. 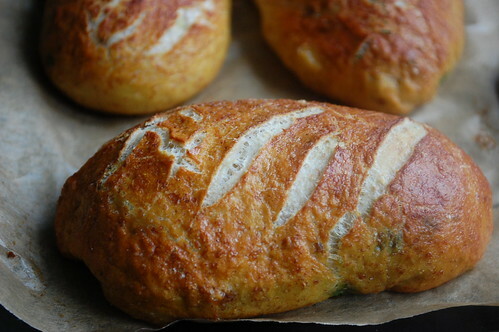 This particular batch of bread dough had produced some chilli pretzel rolls, stuffed with cheese and a few friendly pizzas. 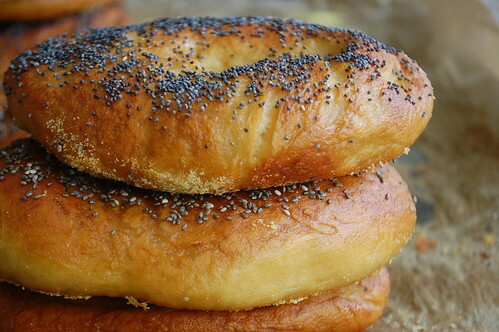 When suddenly the thought popped into my head – how about bagels? 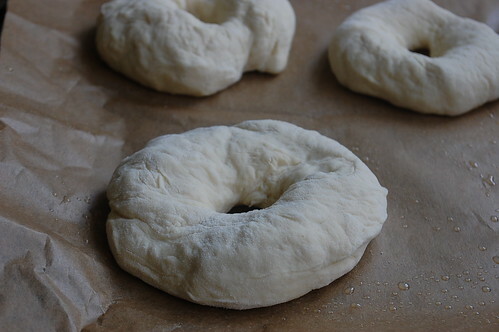 And when I sat behind the computer to execute Step 1 (finding a good recipe), I came across the New Yorker’s guide to Bagels aka Peter Reinhart’s recipe for bagels on Smitten Kitchen. A two-day recipe, but then I’m no stranger to recipes which take a week. 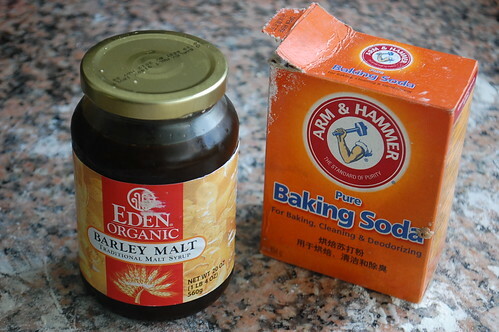 Reading the recipe left me perplexed, confused and a bit dismayed, not because of the ingredient list or the barley malt syrup, which strangely enough I possessed. It was Step 8 of Day one’s instructions, with its command to ‘retard’ the bagels that was at the root of my less-than-confident state. Having never encountered this word in my culinary education to date, I read carefully. • Rope-and-loop: You form a snake shape, loop it around your hand, and roll it on the counter to seal it together. Stretch and poke it was to me. Do you ever have dreams of becoming Italian and spinning some pizza dough in your palm, till it stretches thin, ready to be fired in a 300 degree centigrade oven? If you habour those dreams, then you’ll understand why it was stretch-and-poke- and-whirl it around my little finger. Before long it was Step 8, and the test. There’s usually a test to long and complicated recipes, aye? I gave it a go……and guess what? My bagels were fully ‘retarded’! Joy, unspeakable joy. 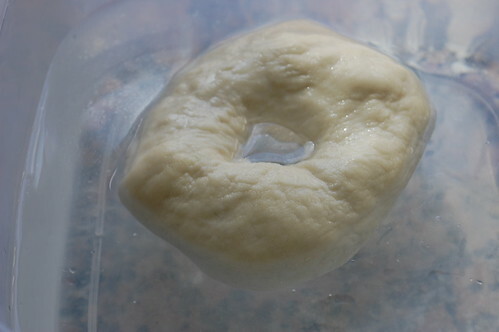 On day 2, I boiled my bagels in a water bath of baking soda and barley malt syrup. 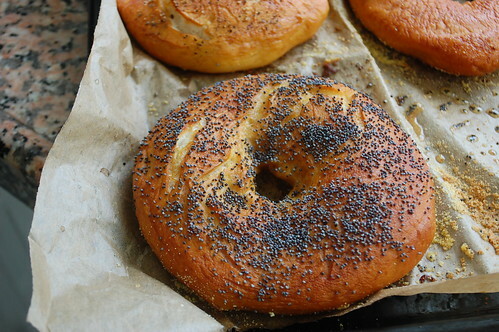 Now some would argue that a bagel is not a bagel if it doesn’t take a lye bath. Not me. I’m not German, not used to the smell of warm, authentic, lye soaked bagels. Pardon me please. I preheated the oven, while I topped some with chia seeds, others with poppy seeds, some were left plain and one or two had freshly ground black pepper. Ten to twelve minutes later, me and my bagels were done. I enjoyed them. Everyday for a whole week. With burrata, fig jam and coppa. Every combination was enjoyed. Thoroughly. And my longing for NYC, abated. For a while. Till the Blueberry Muffin bug catches on.